Snowboarding is one of the few winter sports we all look forward to and odds are if you’re reading this you know exactly what I mean. There’s just something about snowboarding that no other sport provides including exhilarating entertainment you just won’t find in any other environment. Becoming one with the slopes while gaining speed and pulling off some of the most difficult stunts gives us that sense of purpose that’s impossible to replicate. When it comes to snowboarding there are a few things to consider before buying a new board. Simple things we all take for granted are often overlooked which provides an entirely different experience then we thought. The board makes all the difference, and this couldn’t be closer to the truth when looking at what the perfect snowboard can and cannot do. This snowboard buyer’s guide provides everything you need to know including the different types of snow boards, which board provides what type of ride and everything in between. 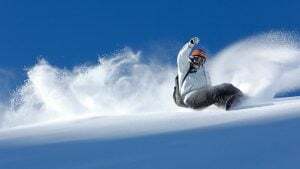 Simply put, snowboarding is a winter sport that involves a snow covered, descending hill and a rider and board looking to own the slopes. Born in the early 1920’s, the many advances in modern technology now provide us with snowboards that are much faster, offer different types of rides and are easier to control than older models. 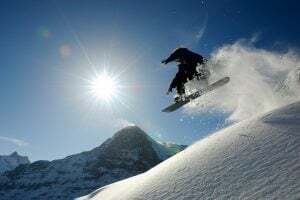 Snowboarding has become an extreme winter sport which is often characterized by stunts, flips and other tricks while putting distance between the board and snow itself. It takes time, experience and patience to get there, but the best thing is that snowboarding is perfect for any skill level. One thing’s for certain, it all starts with the board. Depending on your skill level and the type of ride you’re looking for, there are many different types of snowboard riding styles to consider. From a leisure, relaxing ride over smooth terrain to more of a back country or urban environment, matching the board to your desired riding style will allow you to make the most of any snowboarding experience. This type of snowboarding if often more competitive than other styles below. This type of style involves competition or organized events like slalom, giant slalom and boardercross. Slalom racing resembles skiing where riders are times while snowboarding through a series of gates. Boardercross takes a page out of BMX racing which includes four racers snowboarding simultaneously while navigating jumps, berms and other obstacles. The half pipe is one of the featured sports in the Winter Olympics and over the years there’s been an increase in popularity with enthusiasts. The half pipe consists of a U-shaped snow feature and allows the rider to perform various stunts and tricks at high rates of speed. Some of the most popular ski resorts in the US offer the best places to half pipe including Mount Bachelor, Mount Hood Meadows, Squaw Valley, Vail and Mount Baker. The high cost to build and maintain half pipes makes them scarce around the US, which is why they’re not located in more places. Freeride snowboarding is just that; it provides a relaxing, casual, free ride over smoother, predictable terrain. Perfect for beginners or those just looking to enjoy the, freeriding can be mixed with elements of freestyle which offers so much more. Typically seen by huge downward mountain slopes where speed is always an option. There are dangers worth considering such as avalanches, crevasses and the obscure nature of the location itself. 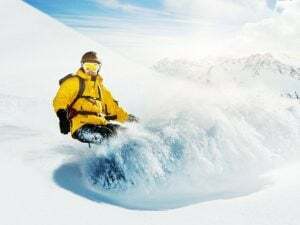 Accessibility to such slopes or massive mountain peaks can be challenging for freeride snowboarders, but when there’s a will, there’s always a way. The versatility and amazing GoPro pictures of freestyle snowboarding is what seems to attract most people. Often seen by amazing stunts and tricks often reserved for YouTube, freestyle riding is a very broad term used to characterize a “free” style of riding. The perfect environment can be anywhere including the back yard, terrain parks, urban setting or back country. Urban snowboarding makes use of anything man-made within the urban setting. We’ve all seen people snowboarding over picknick tables, down railings and in the road, which ends up being a playground for snowboarders outside of a resort. The popularity of urban snowboarding has increased significantly over the years with younger riders and those with a lack of access to a resort, slalom or mountain slope. Snowboards come in all different shapes and sizes and like most things that do, size matters. Boards vary by unique construction, material, size, flex pattern and shape which make them better suited for one style over another. There’s no right or wrong answer when choosing a snowboard, but understanding that preference, weight, height, your own riding style make all the difference. There are five various types including all-mountain, alpine, freeride and freestyle. Below, we detail the different types of snowboards which will help you match your own personal riding style. All-mountain snowboards are the most popular type as they offer greater versatility and are easier to match with varying riding styles. These boards are specifically designed to float while offering more balance in the tail making it a popular choice among beginners. When looking at an all-mountain snowboard, the nose is wider, longer and wider than the tail making it easier to balance. Alpine snowboards are narrow and longer and specifically designed for carving downhill while reaching faster speeds. These boards are recommended if you’re looking for speed, improved stability and greater response with turns and cornering. Because of the design, these boards are not recommended for performing tricks or use on a half-pipe. Freeride snowboards are characterized with more nose than tail and offer more of a setback stance than other boards. They’re designed to move in one direction fast and are popular among those riding in backcountry, steep hills or on hand-packed trails. These types of snowboards are directional which mean they are designed to go downhill and not for performing tricks. Perfect for performing tricks and stunts, freestyle snowboards are lighter, shorter and more flexible. Due to the lack of grip along the edges, these boards do not offer a stable experience for turning or moving fast. Freestyle snowboards can either have a directional twin or twin tip. The directional twin is similar in design to the twin tip, except tail is stiffer than the tip. The twin tip board has a tip and tail that is more centered stance and more symmetrical than other boards. This makes it easier to ride both frontwards and backwards for beginners. Splitboards are primarily used for climbing in the backcountry. These boards split in half which makes it easier to climb and can then be reconnected to ride back downhill. These boards are not for your average enthusiast, but those who have the confidence, skills and knowledge to safely climb slopes and snowboard down the backcountry. To effectively use, you’ll also need a set of skins and a split kit which are usually not included. The snowboard camber is the bottom contour of the board itself. When the camber is flexed due to the rider’s weight which causes a flex that’s continuous pushing the board against the snow. This gives the rider greater control over turns while providing more stability while turning. Cambers are preferred for experienced riders looking for more speed and explosive power in and out of turns. Below, we detail the four types of camber as well as their advantages and disadvantages. A flat camber increases float while providing the rider maximum feel while turning quickly. A hybrid camber (mixed or modified) was introduced by manufacturers to address all sorts of performance issues relating to the other types of cambers. A reverse camber (rocker) provides a natural flex to both the tip and tail. Popular among snowboarders riding in the park or on powder, a rocker makes it easier to initiate a turn. These types of boards are best suited for beginners but provides great pop suitable for experienced snowboarders as well. Bindings directly connect you to the board. The muscle movements by you are transferred directly to your board allowing you to turn or stop. 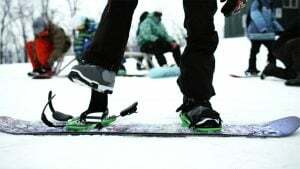 Besides transferring movement, bindings help improve stability while adding a layer of protection to your feet and ankles. Choosing the right bindings can make all the difference right behind the board. The wrong bindings may alter your ride while providing an uncomfortable experience. On the other hand, the right bindings are more comfortable and optimizes rider control. There are two different types of snowboard bindings discussed below. Just like they suggest, fitment of the bindings starts from the back while sliding your foot forward into place. They’re faster to step in and out of and often while securely fastening with a hinged back that wraparounds your heel. Sometimes called speed entry bindings, they’re preferred by those looking for improved comfort. Strap-in bindings are the most common. Your foot is secured inside the bindings with two straps and are suitable for all experience levels and riding styles. They range in a wide array of models from base to feature-rich with greater comfort, support and custom. Aside from the board, camber and rocker, there are other snowboard features that are either standard or can be added to the board as an addon. While not necessary, these features may further enhance your overall experience. Below, we detail some of the key features and terms commonly seen with snowboards. The edges of the board are what grips the snow which helps provide grip while improving turning and steering. The length of the board that touches the snow measured in centimeters is called the “effective edge”. A shorter effective edge makes it simpler to spin and turn. A longer effective edge improves stability at higher speeds while improving grip. The softer the flex means the board is easier to turn and forgiving. Boards that have stiffer flex provide more grip while turning and does a better job maintaining speed. When buying a snowboard be sure you know what you’re looking for before shelling out hundreds of dollars. While not the most expensive sport out there, snowboarding can become expensive if you end up buying what you don’t want and not buying what you really needed. This can change your entire outlook on snowboarding and to take full advantage be sure to choose a snowboard that matches your experience level and riding style. Finding a brick and mortar snowboard shop is always the best way to go, but good luck finding a quality shop offers plenty of boards to choose from. Amazon is the most trusted retailer hands-down and we’ve scoured their huge collection and reviewed only the best. Our unbiased snowboard reviews offer a detailed look into what makes these boards so great and any reason you would want to avoid one. Feel free to browse our reviews below and if you have any questions feel free to leave us a comment below.